This was an interesting cargo bike that we electrified this week. It’s a beautiful cargo bike from DOUZE that has a lot of top end parts on it. However, riding it loaded up with a child and groceries and heading into the sea-breeze is a bit troublesome so the customer asked us to electrify it. Hub motors were no option due to the front wheel having a through-axle and the rear 11 speed internal gear so our only option was to use a mid-drive kit. This proved tougher than expected due to the frame geometry but we got around it all by pulling the motor apart and installing half of it on each side then bringing it back together. 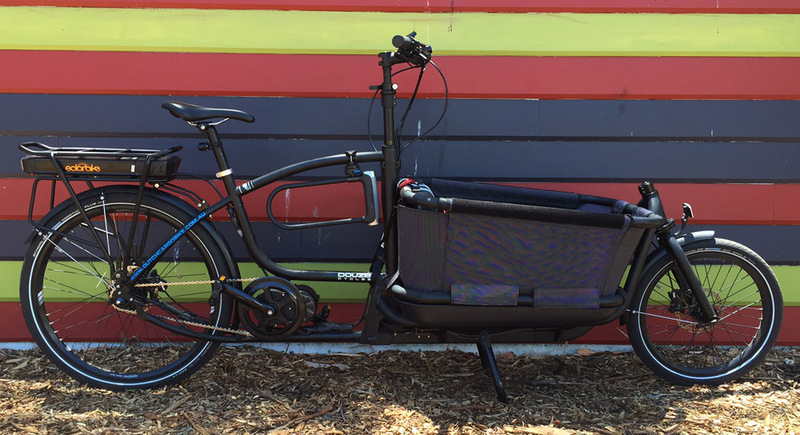 It’s now a great electric mid-drive cargo bike that will serve for many many years to come. Solar Bike. Fremantle Woolstores. January 2017.